Yet efficiency is one of the few methods of addressing climate change that the Trump administration hasn't obliterated. That makes it an outlier in a White House that scrubbed mentions of climate change from its website within minutes of President Trump's taking the oath of office (E&E News PM, Jan. 20, 2017). "Since the inauguration, I think I would describe it not so much as lukewarm but as a slow walk," said Emma Stewart, a climate and cities expert at the World Resources Institute. The White House declined to comment for this story. But it's true that Trump hasn't used his executive branch powers to order the repeal of various energy efficiency mandates established by the Obama administration. An executive order that promotes efficiency as a tool to fight climate change remains on the books. So does an order called "Accelerating Investment in Industrial Energy Efficiency," published in 2012 to prod manufacturers to invest in less energy-intensive options. And an order for reduced driving by federal workers, less paper printing and other efficiencies is still alive. Still, Trump has led other attacks on energy savings, through attempts to slash government funding and delay efficiency standards in the courts. The latest budget proposal from the White House, submitted for fiscal 2019, calls for deep cuts at the Department of Energy's Office of Energy Efficiency and Renewable Energy, lowering funding to about $700 million. And the weatherization office, which works on the sort of programs Obama touted a decade ago in Virginia, would be zeroed out. "The budget is first and foremost where they've taken a hacksaw," said Elizabeth Noll of the Natural Resources Defense Council. The administration is also waylaying the implementation of energy efficiency standards on consumer goods, such as home appliances, HVAC (heating, ventilating and air conditioning) equipment and electronics, by fighting in the courts. In December 2016, DOE adopted four standards to save energy. They applied to air conditioners, compressors, boilers and power units. But the Trump administration still has not published the standards. In a court ruling that month, Vince Chhabria, a federal judge, ordered DOE to release the standards — a decision the administration appealed. "There is a clear decision by the administration not to pursue appliance standards as a form of energy efficiency," said Sue Coakley, executive director of Northeast Energy Efficiency Partnerships. If companies don't meet energy standards, they can be blocked from selling their products. And corporate rivals often make the best regulators, Coakley said. "The other manufacturers are pretty quick to point that out to DOE," Coakley said when asked what happens to companies selling out-of-standard products. "There's a fair amount of self-enforcement that goes on." The administration has held up at least 28 efficiency standards, according to Stewart. Separately, the White House tried to muscle through deep cuts to Energy Star — the popular savings program — only to see Congress swoop in to protect it. "Unfortunately, the administration has proposed deep cuts to high-return federal efficiency investments, putting our R&D innovation engine in jeopardy and making it harder for new efficiency technologies to be fully commercialized and deployed and start to deliver real savings," Jason Hartke, president of the Alliance to Save Energy, said by email. By 2014, the energy efficiency industry was responsible for more than 100,000 jobs in the American Midwest alone, according to figures from the Midwest Energy Efficiency Alliance (MEEA). The tallies are far higher nationally: about 2 million at the end of 2016, according to one nonpartisan group. An industry official who has interacted with the White House on efficiency agreed. It's puzzling that the administration doesn't talk more about its benefits, because it employs so many Americans and saves money, the source said. "It's all about wasting less," this person said. Energy efficiency is a hard message to push within an administration focused on near-term results, not long-term strategy, observers said. Some projects might require capital investment initially before saving money over a period of 15 years or more. "This should be something that this administration and the Republicans in Congress could embrace," the industry source said. "It's unfortunate that cleaner has become a bad thing." Still, the administration does not appear dead set against efficiency. 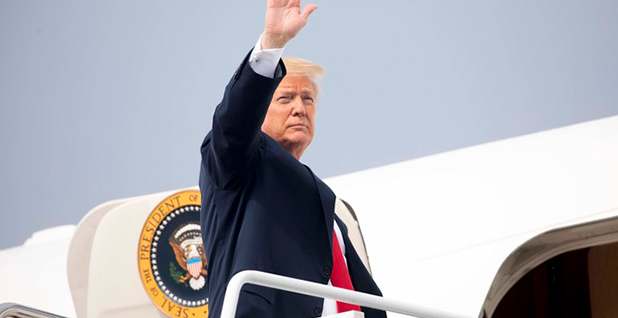 Trump rescinded an executive order on environmental sustainability at government agencies last week, watering down language about climate change (Climatewire, May 18). But he kept portions on energy efficiency, and his order calls on agencies to curb their power consumption. Also this spring, the White House proposed a $500 million increase for a DOE office that focused on efficiency. "Agencies have identified energy efficiency projects which if implemented could save the Federal Government millions of dollars annually in energy and maintenance costs," the White House said in a memo with that request. A former Trump energy adviser, Mike Catanzaro, backed efficiency policies during his White House stint because they save the government money, according to sources familiar with his work. And Vice President Mike Pence is at least a tepid supporter of performance contracting, a technique that lets local, state and federal agencies retrofit their buildings without putting up any money. At a meeting with Energy Systems Group, headquartered in Newburgh, Ind., Pence signaled his support for performance contracting, according to a person familiar with the matter. "He wasn't hindering efficiency, but we haven't seen him embrace," the industry source said of Pence's record as Indiana governor and vice president. Some Cabinet secretaries have gone to great lengths to cut back even the smallest efficiency measures. In a little-noticed letter published in December, HUD said it would no longer insure mortgages on homes with PACE liens. Overall, massive financial and energy savings are at stake, said Lowell Ungar, an analyst at the American Council for an Energy-Efficient Economy, an advocacy group. Efficiency programs created by the Obama administration set the United States up to save more than $2 trillion through 2040, Ungar wrote in a blog post. Unlike Obama, who made site visits and used the bully pulpit to talk about efficiency, Trump has made no such roadshows. Also under Obama, the White House supported industry-led projects about saving energy, such as the Green Button initiative and the Better Buildings Challenge, now housed at DOE. The White House has not taken down the websites for those programs, but they're not priorities anymore. "I've literally not heard anything about that in the last year and a half," Ungar said of the Green Button, an effort to provide utility customers easy-to-understand energy data. Energy efficiency only comes up once on the White House website: It's related to Trump's recent executive order. Correction: A previous version of this story overstated proposed budget cuts to the Department of Energy's Office of Energy Efficiency and Renewable Energy.